It was November 2014. I had a 3-year-old, a 17-month-old, and a 3-month old. I was overwhelmed. I was exhausted. I was suffering. I was stuck in the deep muck of failure. I was failing at motherhood by the world's standards. I was failing at life by my standards. I was failing at holiness by God's standards. I was so tired of failure. Then God told me the most freeing news: I would always fail. I'm a sinner saved by grace, but I'm still not perfect. No one is. Only God can be perfect. I didn't need to be perfect. God didn't want me to be a perfect mom, a perfect woman, or even a perfect Christian. If I was perfect, I didn't need Him. Instead I should be content with weakness. My weakness was a ticket to God's strength. When I feel competent in my roles as mother, wife, and Christ-follower, I rely on my own strength (and always fail). Instead I needed to give up the pursuit of being the best mom and focus my life on filling up with God's grace. I've probably always known this truth, but applied to my life as a mom, my mind was blown. All I needed to do was sit in God's daily grace. I would fail at times, but I could retreat back to Him as my savior instead of myself. When I get motherhood wrong, God gets EVERYTHING right. In fact, He can use my failure as an opportunity for me to receive more of Him. What Good News! As this truth started to reshape how I viewed motherhood, I couldn't believe that it took three babies (in three years) for me to figure this out. I wanted to shout it from the rooftops--Mommies of the World: we don't have to be perfect! What sweet relief! I wanted everyone to know. I can remember one specific middle-of-the-night feeding. I was scrolling through facebook, and I grew so discouraged as I saw several friends with young babies who were obviously struggling through the same painful failure I had experienced. I wondered why there wasn't a book I could send to them. They needed help! Then God nudged me. Maybe if there wasn't a book to point them to God's grace through the complicated first year of a baby's life, someone needed to write it. Maybe that someone was me. The idea seemed crazy. It was crazy. It is crazy. All of my previous insecurity came pushing forward: I wasn't a Supermom. Women shouldn't look to me for how to do motherhood. All I knew how to do was fail at all of it. But then I realized I probably could write the book on failure, the book that encouraged women to let go of all the expectations and embrace God's daily grace for their imperfection. I could probably write that book. So I did. It's called UnsuperMommy. I wrote the book mostly on my phone as I played with my children. It was the impossible task that God wouldn't let me shake. I tried to quit so many times, but God would inevitably push me back into it using unsuspecting friends and acquaintances that convinced me this book was needed. Writing the book was a constant act of God's grace. He transformed my own heart through writing it, and I pray that it will one day be the means God uses to bring other mommy hearts into the shelter of his grace. I've always planned to self-publish UnsuperMommy. I knew how much work it was to do a book proposal, get an agent, rewrite the book proposal, and finally get a publisher. My husband wanted me to pursue traditional publishing, but I just didn't have it in me. One day I felt God nudging me, "But have you prayed about it?" I hadn't. So I prayed, "God, if you want this book to be traditionally published, you'll have to make a publisher reach out to me." I laughed in my heart as I prayed. I knew it was a ridiculous prayer. I didn't know anyone in the publishing industry and I didn't have a "k" after the number of my followers on Instagram. But I prayed that ridiculous prayer, and God answered it. Because He can do ANYTHING. When will I ever learn? Enter the magic of social media: I had been trying the new app periscope out as a way to practice public speaking. Periscope is the toastmasters of my generation! When I would start streaming on periscope I felt like I needed to introduce myself. 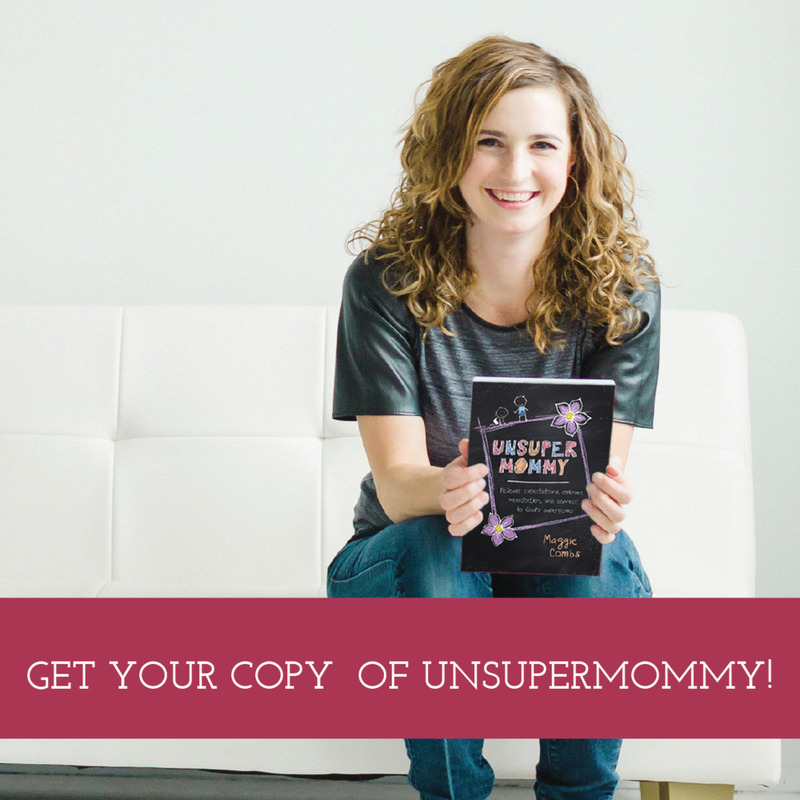 Before I even realized it, I was sharing publicly that I was writing a book called UnsuperMommy. Generally I was a bit embarrassed (and nervous that I wouldn't finish) to announce that I was writing a book, so I had avoided sharing about it on both Facebook and Instagram. But that magical Periscope, it just brings out all the secrets! Here's where it gets crazy: the day after I prayed what I thought was a silly, impossible prayer, I got an unexpected message on Facebook from one of my teachers from Junior High. He had seen a few of my periscopes (yep, the only place I talked about writing a book) and Instagram and he thought he could help me with my book…because he is the editorial director for a Christian publishing company called BroadstreetPublishing! I couldn't believe it. I probably read that message 10 times before it started to sink it. We met and it was a perfect fit. A match literally made in Heaven. Now I'm signed to publish my book with Broadstreet Publishing in 2017. Because God writes the best stories. Because God gave me that teacher in that tiny Christian school so many years ago. Because God brought me to the end of myself in motherhood. Because God wouldn't let my mind rest without sharing how his Gospel applies to the hardship of motherhood. Because God prompted me to pray. Because I did so with only a mustard seed of faith. Because God directed me to be open on Periscope about my calling. Because God gave David Sluka's wife a crazy 3 babies in 3 years mothering situation even more difficult than my own. Because God can use something as trivial as social media to connect two people together for His purpose. Because God is God over every little step along the way. I need you all to hear this: I didn't do anything. I obeyed God's calling by the grace of God alone. Lord willing, I will continue to obey him. He has been responsible for all the fruit so far. He alone will be the creator of all the fruit. I'm just blessed to be a part of this. When you hear this story, please don't think I'm special. I'm just stewarding a gift from God. Please join with me in praying for UnsuperMommy to reach far beyond the limits of my circle of influence to all the women God knows desperately need the truth of the Gospel to free them from Super Mommy expectations. Pray that I remain obedient to his calling among the pressure of daily life as a mom. Pray that the fruit of UnsuperMommy is God's glory, not mine. If you want to follow along with me on my journey, I'm @unsupermommy on Instagram, Periscope, and Twitter. Soon I'll have unsupermommy.com up and running, but until then you'll have to follow this humble blog to receive encouragement in embracing imperfection to receive God's grace!